A programme which targeted the lifestyles of male football fans of 15 European football clubs has been more effective in improving physical activity than other physical activity intervention programmes, according to research published in PLOS Medicine today. The European Fans in Training (EuroFIT) programme, an EU-funded randomised control trial of 1113 men aged 30-65, carried out across 15 professional football clubs in England, the Netherlands, Norway and Portugal, also led to important improvements in diet, weight, wellbeing, self-esteem, vitality and biomarkers of health risk. The clubs involved in the trial were Arsenal, Everton, Newcastle United, Manchester City, Stoke City (England); ADO Den Haag, FC Groningen, PSV, Vitesse (the Netherlands); Rosenborg, Strømsgodset, Vålerenga (Norway); and SL Benfica, FC Porto, Sporting CP (Portugal). EuroFIT is a groundbreaking programme which harnesses the intense loyalty that many fans have for their club, using this to attract them to a lifestyle change programme at club facilities. 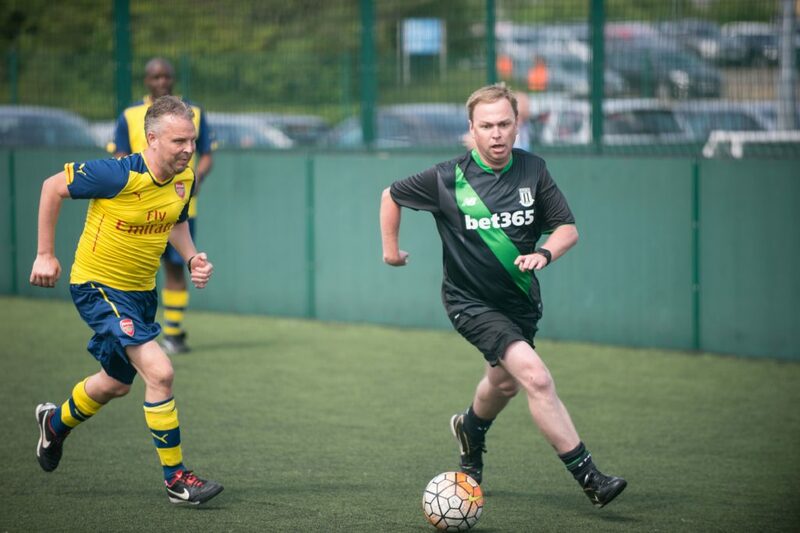 EuroFIT is delivered by club’s community coaches in football club stadia in 12 weekly, 90-minute sessions which are aimed at increasing physical activity, reducing time spent sitting and improving diet in a way that maintains change over the long term. A novel pocket-worn device (SitFIT) developed for EuroFIT by the Glasgow company PAL Technologies allowed self-monitoring of time spent sitting and daily steps, in real time while a game-based app encouraged between-session social support. In the randomised control trial men were split into two groups. The first group undertook the 12-week, group-based EuroFIT programme straightaway, and the second, comparison, group were asked to wait until after the trial to take part. After a year, men who took part in EuroFIT were doing on average 678 steps a day more than the comparison group. They had also improved their diet, eating more fruit and vegetables, less fat and less sugar and had increased wellbeing and vitality. However, attempts to reduce time spent sitting were not successful. After a year men who did the programme were not sitting less than those who had to wait to take part. EuroFIT was built on the experience of the Football Fans in Training (FFIT) programme. FFIT was developed and evaluated by a team of researchers led by the University of Glasgow, is delivered in Scotland by the Scottish Professional Football League Trust and has been adapted for delivery in Canada and Australia. Using cutting-edge behavioural science EuroFIT adds the novel technologies in a bid to prevent, rather than treat, chronic illnesses associated with inactivity, such as type2 diabetes and cardiovascular disease. In addition, EuroFIT included part of the “toolbox” of strategies for enhancing sustained behaviour change. Professor Sally Wyke, the programme’s Principal Investigator and Interdisciplinary Professor of Health and Wellbeing at the University of Glasgow, said: “The results of our randomised control trial of EuroFIT support the findings of the earlier FFIT study. Gender-sensitised lifestyle programmes delivered in professional football clubs show great promise in Europe and could play an important public health role in engaging under-served men. “The results also show that reducing the amount of time that people spend sitting is a real challenge for public health. We recommend that future lifestyle studies should attempt to ensure that participants understand the distinction between being more physically active and spending less time sitting down being very inactive. Sally Wyke1*, Christopher Bunn1, Eivind Andersen2, Marlene N. Silva3, Femke van Nassau4, Paula McSkimming5, Spyros Kolovos6#b, Jason MR Gill7, Cindy M Gray1, Kate Hunt8, Annie S Anderson9, Judith Bosmans6, Judith G.M. Jelsma4, Sharon Kean5, Nicolas Lemyre2, David W Loudon10, Lisa Macaulay1#a, Douglas J Maxwell10, Alex McConnachie5, Nanette Mutrie11, Maria Nijhuis-van der Sanden12, Hugo V. Pereira3, Matthew Philpott13, Glyn C. Roberts2, John Rooksby14, Øystein B Røynesdal2, Naveed Sattar7, Marit Sørensen2, Pedro J. Teixeira3, Shaun Treweek15, Theo van Achterberg16, Irene van de Glind12, Willem van Mechelen4, Hidde P. van der Ploeg4.